I had been baking all morning. I made some Chocolate Chip Cookies, Coconut Cookies, and Anisette Cookies. Yeah I know, I'm repeating myself. Actually, I am writing this right after I wrote about the Anisette Cookie recipe. Tasty cookies, amazingly easy batter to work with too. But, I was informed. Told. "Lunch today is a Cheesesteak, and by the way, you're making fries". Actually, Kevin makes a good cheesesteak. We had gotten some appropriate "Home Made Hoagie Rolls" at Publix. Just how a supermarket chain can make a "home made" roll, I don't know, but they do make a good roll. They're not Amoroso, but they're damn close. That trip to Publix, I actually found Cheese Wiz. What Cheese Wiz is, I don't know. We discovered that it makes a great dip for crackers though. So we started. A quarter of a sweet onion got grilled. Twice what I needed but hey, I have eggs and I know how to use them. Then the rolls were thawed, split, and slathered with a generous layer of that Wiz stuff I was talking about. The Steak was cooking in the skillet. I put half of the onions on top. The onions immediately stuck to the "Cheeze" like substance. Then the steak. It melted the cheese. 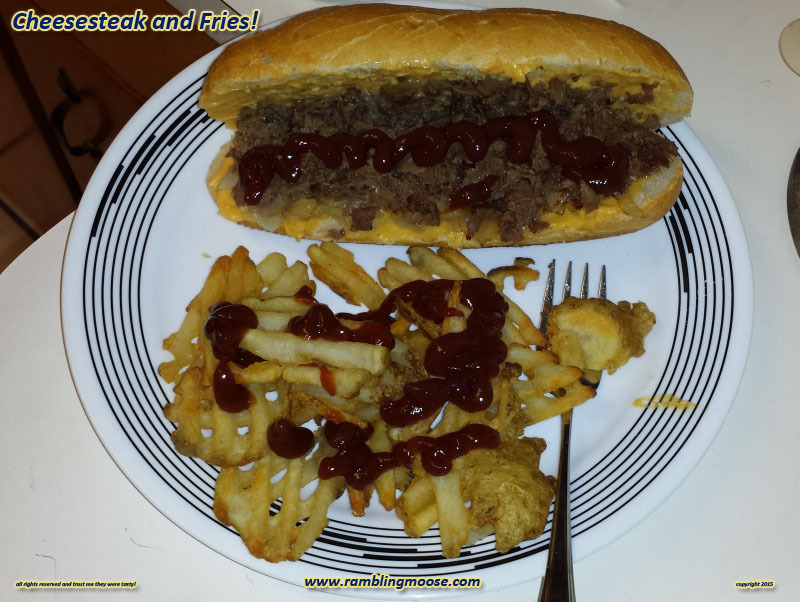 On a whim, I squirted catsup on the fries and the steak. See, Cheesesteaks are a religion in Philadelphia. Museums are online dedicated to the art of the perfect Cheesesteak. There are a laundry list of places that people will visit over others. Every one of those people have most likely tried to make a steak at home. I grew up with Provolone on mine, but mom was Italian and didn't speak English until she was 7. But, here in South Florida the true cheesesteak is not something that you can't find easily. There are some close calls, but it's a bit off. Like that roll. Good, close, but not Amoroso's. No worries, it was a great meal.